Dubai, UAE, 31 March 2017: Emirates Group Security (EGS) organised an Annual Family Fun Filled Day on 31st of March 2017 from 1400hrs – 1900hrs at the Emirates Aviation College (Football grounds). 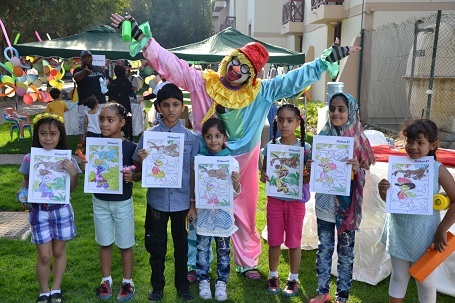 The family day created a full of fun and excitement day for children and adults with a great selection of outside activities available to keep everyone entertained, as well as brought together employees and their families who interacted with each other. Events on the day included sports, game-booths, talent show, live DJ music, kid’s activities and numerous raffle draws which consisted of impressive grand prizes namely, an Aviator F-Series wristwatch, several raffle draws to enter the Dubai Duty Free Ducati motorbike raffle draw, Diesel travellers suitcase, TV set, kitchen appliances among other impressive prizes. The highlight of the day was the tug-of-war which brought out the competitive spirt of all those involved. Children below the age of 12 were mesmerized by a magician and playful clown. The crowd then enjoyed a sumptuous BBQ and a wide range of buffet dinner. The climax of the day was the evening which was crowned with live DJ music making all the staff and families on site entertained, bringing the event to an exciting close. Staff walked away with numerous prizes that they won either in the raffle draws or as a souvenir for taking part in the day.